Give username and password if upload account is required. Uploading instructions will be emailed to you within 48 hours. The Vision 4D frame sandwiches your image(s) between two acrylic blocks, creating a total depth of 8 mm. These are then adhered to either a high gloss black or frosted back plate, giving a striking visual appearance. 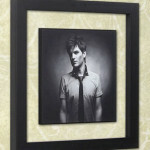 “Easy to hang” acrylic hanging blocks are used for easy display on your wall. Note that individual images can be orientated in a portrait (up) or landscape (view) aspect, or combinations thereof, for each product depending on the number of images in your chosen frame – see the table below for more information. You will need to supply one (1), three (3), six (6) or nine (9) images with each Vision 4D frame. Please note that choosing a metallic finish paper for your images will attract an additional charge of £10.00. This is a very heavy product – professional wall hangings will be required. To purchase your frame through my website, contact me to organise a download account or email me your images (please include your contact details, any clarification notes, Paypal order numbers or other instructions as necessary with your payment/ email). For multi image frames, you should include a note as to your desired image layout, if required. You can also upload your images directly through this page (see the image upload field above). Be the first to review “Vision 4D Acrylic Frames” Click here to cancel reply.